What do you think of when you hear the phrase, “free library resources?” Books? DVDs? Today’s libraries offer so much more! With an internet-connected computer and a valid library card (and sometimes a pin number), thousands of free resources are available to you! Most libraries are connected with an interlibrary loan system, and you are able to check out books from libraries all over the country. Ask your branch about their system. Most of the time you can request books online and they’ll find them for you. Libraries have a wealth of online resources (databases and e-sources) on their websites for students. What’s great about these? They’re “referred” sources—true, authoritative sources far better than Google. Search your library’s website for “e-sources” or homework resources. Plan a field trip to the library. The children’s or youth services librarian will be happy to make your visit so much more than just a tour of the library. One of the things the librarian can do is show your group how to use the online resources available to them. If you’re working on a specific unit or project, she can also gather materials for you and/or help you and the children find materials. Some libraries offer book club kits for children. Most kits consist of twelve to fifteen copies of a title with discussion questions if you’d like to do a book club with other students. Most libraries have monthly school-age programs at the library during the school year. And don’t forget the summer reading program! Many libraries have special classes or programs. Looking at our local library’s schedule, these are some of the things they offer: Family Movie Night, Knitting Circle, Theatre Camp, Writer’s Workshop, Snack Attack (Cooking), Finger Knitting, Lego Block Parties, Puppet Shows, and Storytime. If you have an idea for an activity you’d like to coordinate, talk to your local librarian. Some libraries will schedule computer classes for your children if you ask. Libraries have a variety of booklists of suggested titles for different age groups and on many subjects. Many libraries provide a link to “Homework Help” on their website. Some libraries give you access to websites like Tutor.com for free! 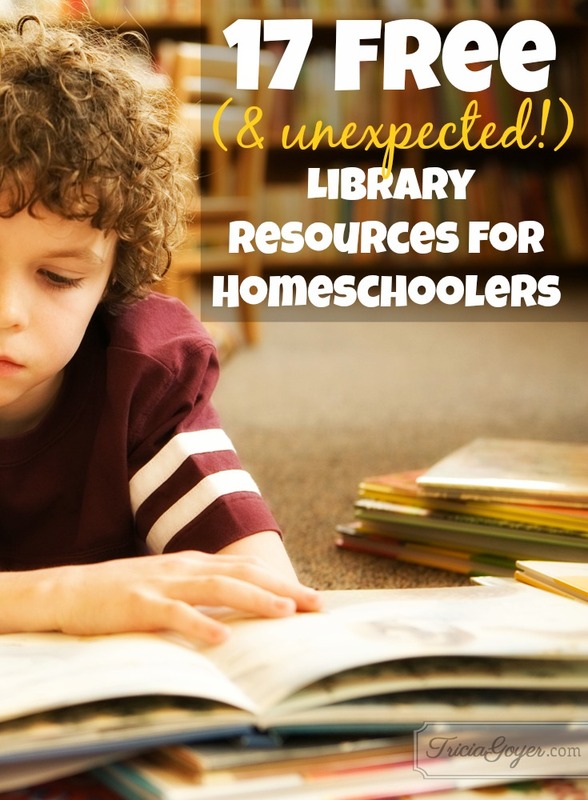 Find out other free library resources and read the rest of this post at FreeHomeschoolDeals.com. Libraries offer a lot for adults too. My local library offers classes on several different things. We live in the computer age but I come before the computer age. When competitors arrived I never felt the necessity to use one. Then they became a necessary item to have and know how to use. Several times I took classes but just couldn’t generate interest in them. My last few years of working I had to use computers and barely got buy. It wasn’t till I had retired that I noticed my local library was having classes for computer so I signed up. It took just one class and the librarian had me up and going. Later my husband bought me a kindle fire for Chritmas and the head librarian gave me one on one time to teach me how to download ebooks from the digital library. A few weeks ago my husband and I signed up for a Facebook class. My husband has signed up for Facebook but has no idea how to use it. I think the library is a wonderful resource and since we pay for this privilege from our taxes we should take advantage of things they offer or we will lose out on what they offer to the public.